I’ve determined that difficult people are like the poor. Fair enough. Just so long as they’re not near me. I’ve gotten pretty good at keeping a safe distance from difficult people. One of the perks of being a full-time community volunteer is that I can be choosy about my job assignments. So I choose to work alongside wonderful people. Gracious people. Easy-to-get-along-with people. And dial my exposure to difficult down to a minimum. But there’s no escaping the difficult . . . that lives under your own roof. That would be one of my children. This kid has been pushing my buttons ever since those little arms were long enough to reach them. Given this is also the child who’s most like me, I don’t know where they get it , but I do know I’ve endured years of difficult on their behalf. As we’ve been struggling through a particularly difficult season, my patience with difficult is at an all-time low. While I try to stay cool amidst the tough times, I can lose it when confronted with trash talk. Like the kind I had to hear the other day. Snarky. Sarcastic. Words that, coming from child to parent, came across as rude, disrespectful and completely uncalled for. I won’t stand for difficult. Not in my house. 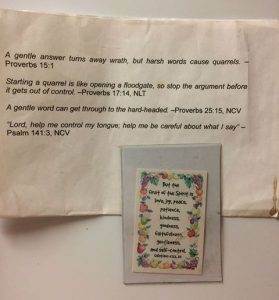 The next day, while cleaning up said house, I uncovered some scripture verses stuck to the fridge. I’m sure I put them there years ago, as truth-in-love reminders for my children when they were having difficulty getting along with each other. Right. Because they’re the only difficult people who live in this house. Difficult may not start with me. But it can always end with me. Having chosen to follow Jesus, I don’t get to choose how much difficult I must deal with. Rather than distance myself from difficult people, I am called to model Christ in the midst of them. And his directions are very clear: overlook offense, control my tongue and bear with those around me in love. Then there’s that whole “turn the other cheek” thing. It’s not enough to let difficult just roll off. We need to lean into it and love others in spite of it. Our ultimate assignment is to treat all with kindness, compassion and forgiveness. Because any time we are difficult, that’s how God deals with us.